Purpose: An active way to allow students to explore a range of emotions. 1. Create a cross in the center of the playing area. This can be done with jump ropes, chairs, chalk, etc. The goal is to make it clear there are four distinct quadrants that the students will pass through as they walk around in a circle. 2. Tell your students that each quadrant (section) represents a different emotion. 3. You can start out with easy emotions such as “Sad”, “Happy”, “Angry”, “Shy”. 5. Have the students walk neutrally around the circle. Play music during this time. 6. When the music stops, each student should notice their section and begin acting out the feeling. They can do this however they think best. 7. Remind students there should be no physical contact with any other student. 8. After about 15 seconds, play the music again and repeat. 9. Play a few rounds. Then assign the quadrants new “feelings”. – The quadrants can be used for any category that you want the students to explore, i.e. professions, ages, locations, weathers, sports, decades, etc. – For older students, consider having them walk in slow motion, instantly putting the quadrants into their bodies/acting as soon as they pass into a new section. 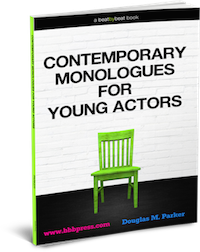 You can occasionally call out “stay put” to have them stay in their current quadrant for awhile and being to develop their “character” or “scene”. – Consider giving the students a specific prompt for each round. i.e. You are all spies! And they must act out the different emotions as that character. – It’s best to write out all the quadrant labels ahead of time so you’re not wasting time doing it during the activity. Do you have suggestions for how to label the quadrants? Leave them in the comments below! At Beat by Beat we’re passionate about inspiring kids through theatre. That’s why we create and publish a high-quality collection of musical plays for kids and teaching drama resources. I played it with my summer students today FUN! I was thoroughly impressed by the theatre games.